Whether you enjoy dressing up for work often or you prefer to save the dress up shoes for special occasions like weddings and black tie events, you can’t go wrong with having a go-to shoe like the Whole-Cut leather shoe in your closet. The Whole-cut shoe has virtually no stitching, which is usually what brings out the casualness in a shoe, and it’s slowing becoming the “new” tux shoe for those that do not wish to wear patent (a shoe that traditionally is worn with a tux but not as versatile). 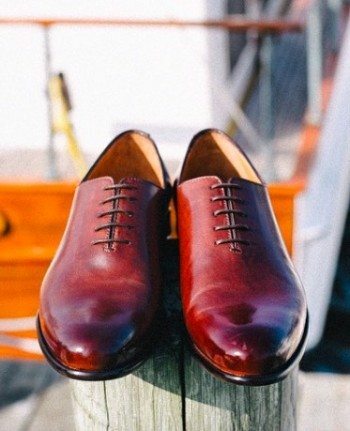 Whole-cut oxford shoes feature an upper (the leather that is visible above the sole when a shoe is worn)constructed from a single piece of leather. Most dress shoes are made from multiple pieces of leather sewn together. In whole-cut shoes, there are no additional pieces – no vamps or no quarters. The sharper chisel toe on whole-cuts gives the body of the shoe a little more purpose, an appearance of an elongated toe design thus dressier appeal. The raised bump on the toe speaks of intentional higher style that sets them apart from regular shoes. The wholecut oxford has the distinctive closed lacing system and this along with the single piece construction gives it an extremely clean and sleek look. 5 Reasons you should consider buying a pair of whole-cut oxfords. They are versatile: The simplicity of a whole-cut oxford shoe adds style and elegance to any outfit. The less adorned a shoe is, technically the more formal it is. The lack of decorative features tends to make whole cut leather shoes appropriate for black tie or formal events. While whole-cut shoes in black are best worn with a suit, a brown or tan whole-cut can be the perfect shoe to wear with jeans too. The Minimalist Design: With clean lines and no seams – these type of shoes stand out for the minimalist design. They represent the simplest and purest form of luxury shoe making. The one-piece upper also makes whole cut shoes more durable and easy to wear. High Quality Leather: The hides necessary to create whole-cut shoes are rare, which increases the cost of making these shoes compared to more regular shoe styles. The whole-cut style is the most expensive and exclusive shoe pattern available as it demands flawless single pieces of leather. The skins that are used to create shoe leather are free of marks and blemishes. The texture of the leather is consistent across the entire shoe. Whole cut Dress Shoes Are Easy To Maintain: With no stitching to get in the way of the shine, whole-cut shoes absorb polish and display shine better than other styles of dress shoes. 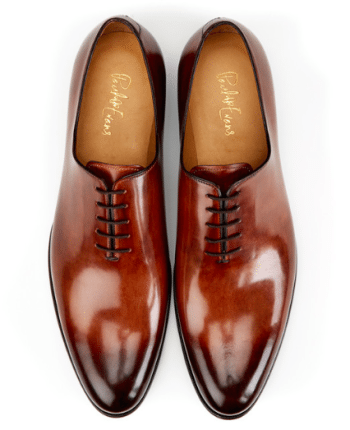 The high grade of leather used (generally calf skin) for whole-cut shoes radiates a brilliant shine. Whole-cuts Will Conform To The Shape Of Your Feet: The leather on whole-cut shoes is not restricted by stitching and vamps to conforming to the shape of your feet. If made properly, the leather of a whole-cut shoe follows the shape of the foot – creating a sight of appreciation that is more appealing to the eye compared to shoes that have stitching. Because whole-cuts mold to your feet, they should fit snugly as they will slightly expand over the first few wears (especially if the leather used is thin). Do you own a pair of Whole-cut Dress Shoes? If not, what is your go-to shoe for “dress up” events?